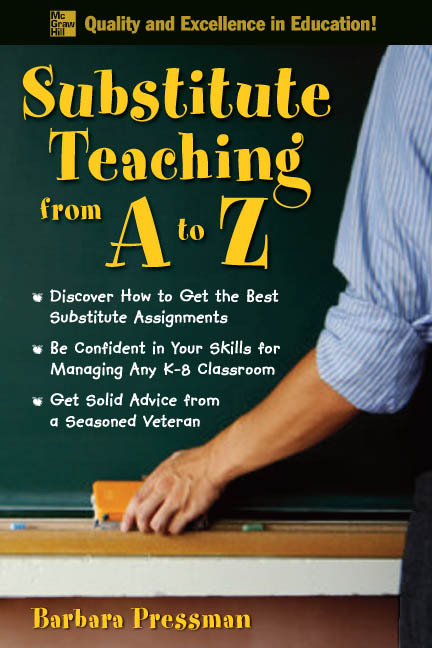 Author's note: I've written the Substitute Teaching from A to Z as a how-to guide for anyone who wants to be a substitute teacher. I've tried to give you a collection of simple and effective guidelines, tricks of the trade, and teaching skills that you can put to use in your very next teaching assignment. The book: Substitute Teaching from A to Z is organized into 26 chapters, A - Z. Written in a simple and accessible style, the book covers pragmatic skills that are required from the time a you walk into the front door of a new school in the morning to the time you dismiss the children at the end of the day. The Substitute Teaching from A to Z uses a question and answer format within each chapter. This format addresses questions that new (and even experienced) substitute teachers might ask a master teacher who would serve as their mentor. This personalizes the presentation and allows you to acquire solid teaching training in a painless manner. To learn more about the book, click on any of the links on this page.